Eloise Greenfield is a towering figure in the field of children’s literature. 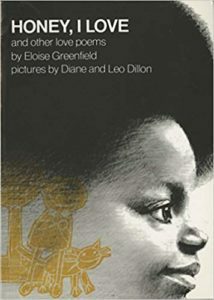 Childtimes, Grandpa’s Face, She Come Bringing Me That Little Baby Girl, and Honey, I Love and Other Love Poems are just a few of her books that play an important role in our programs and libraries. Children’s books are the cornerstone of our work; in a way, the authors are our behind-the-scenes collaborators. We were honored that Ms. Greenfield took some time recently to answer our questions about her writing life, and in the process touched on the topics of teaching, family, society, and growing up in Washington, DC. I want two things: to spend the hours of my life doing something that is satisfying to me and to make a contribution. I leave the assessment of my growth to others. Once in awhile someone will say that Honey, I Love and Other Love Poems is still my best book. Someone else will tell me just the opposite, that I have really grown since I wrote that book. How do you keep out the noise of the world, tap into your creative self, and write from your soul? Greenfield: I give myself permission to judge my work. My judgment is not the only valid judgment, but it is one of them. It is based on my study of the craft and on my experience revising and revising my manuscripts until I feel that every word, line break, punctuation mark, and all of the music is what I want it to be. I ask myself over and over, “What does it mean, how does it sound, what does it mean, how does it sound?” I ask myself about punctuation, whether I want the reader’s voice, silent or aloud, to stop at the end of the line (a period), to barely pause (a comma), or not to stop at all (no punctuation mark). This revision process can take a few weeks or several months, depending on the length of the manuscript. I don’t submit it to a publisher until I am totally happy with it. When, and if, the manuscript is accepted, I give serious consideration to each editorial suggestion before I make final decisions. I don’t think it’s possible to keep out all the noise of the world. It intrudes and forces us to make decisions about our responsibilities. I think that, like most people, I try to do what seems most important at the time. That can vary from staying alert to what is taking place in the world to withdrawing into my private world as a writer. However, regarding my assessment as a writer, I always hope that readers will enjoy and be moved by my work. 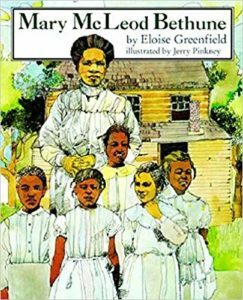 Collaborative Classroom: One of your missions in life has been to publish books that show not only extraordinary African American historical figures (like Paul Robeson, Rosa Parks, or Mary McLeod Bethune), but also contemporary people living their daily, courageous lives. In general, how do you feel about the progress of representation of African Americans, as well as of all people of color, in children’s literature from when you published your first book (Bubbles) in 1972 to now? Greenfield: I won’t try to speak for other cultures, but regarding African Americans, I think that much progress has been made in the depictions of characters. Progress also has been made in the number of books published, but not nearly enough. See the recent statistics of the Cooperative Children’s Book Center. Collaborative Classroom: You’re admired for your word choice (for example in “Harriet Tubman”) and the musicality of your poetry, and I don’t think it’s a coincidence that you talk about the freedom to break rules in creative writing. Could you explain the power of that freedom and what it allows writers to do? And, somewhat relatedly, could you also suggest ways teachers can support and show respect for student writers for whom English is a second language or who may speak another language or style of English at home? Greenfield: I try to capture the music I hear in my head. We know that words have rhythm, but they also have melody. When we listen, we can hear the way our voices go up and down when we talk, creating melody. The key word here is “creative.” Writers are creating their own rules of vocabulary, grammar, spelling and punctuation, their own music, as well as their own stories and poems. 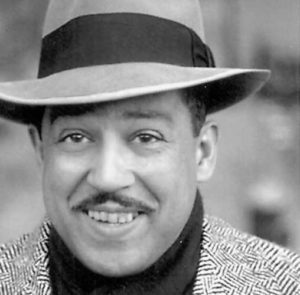 We can hear and see the individuality in the works of Amiri Baraka, Nikki Giovanni, Langston Hughes, Gwendolyn Brooks, Sterling Brown, and many others. In teaching creative writing to children, I think it’s important that we allow them to create using the music they hear in the language with which they are most familiar. In other parts of the day, they will learn English, the language that will allow them to communicate and function efficiently in American life. Collaborative Classroom: In our Being a Writer program, we begin the year by building a community of students who will write about things that interest them, share and talk about their writing, and learn about what professional authors do. If you were sitting in a classroom, telling a group of third-grade students about what professional authors do, what would you want them to know? Greenfield: First, I would want them to know that human beings, no matter what their occupation, are not clones. They have different feelings, different tastes, different goals, different ways of thinking and speaking, etc. I would advise children to become people-watchers and observe these differences in order to create characters. It’s also important for professional authors to care about their work and their readers, and, barring emergencies, to make time in their lives for their work. 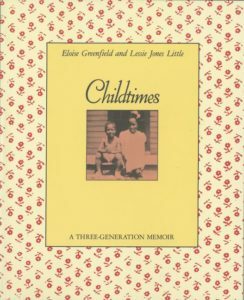 Collaborative Classroom: You wrote Childtimes with your mother, Lessie Jones Little, and you have now long passed the age she was when you published that book together. Have you considered writing a Childtimes II with your children and grandchildren? If you did, what changes in the world and in your family do you think the narratives would reflect? Greenfield: I think if we wrote another such book, it would be forced. Childtimes was born because I sent copies of my early published short stories to my grandmother. She had always loved to read fiction and to recite poetry at her church. After she received my stories, she began to write about her life and she gave me her manuscripts. My mother, who had always loved to read and draw (she taught me to read when I was in kindergarten), also had begun to write, and after my grandmother’s death, the idea for our book fell into my lap. Collaborative Classroom: In Children of Long Ago, you wrote, “I am grateful that my mother was my mother. As I write this, I am sad, missing her, but I am also joyful because she still lives in the hearts of many .” How did the passing of your mother change your life? Greenfield: Children of Long Ago, a picture book of my mother’s poetry, illustrated by Jan Spivey Gilchrist, did not originally include any of my writing. After it went out of print and was being reissued by Lee & Low Books, I was asked to write an introduction. The book is still being published by Lee & Low. My mother died in 1986. I was 57 years old, a mother, and grandmother. I was writing and being published regularly. I was very sad to lose my mother, but after taking a break to rest and get through the worst of the grieving process, my life went on as before. Greenfield: We moved from North Carolina to Washington in 1929, when I was a few months old. We lived in three or four different houses, all of them brick row houses, in attractive but modest neighborhoods. The Great Depression had begun, and African American homeowners, who had fallen on somewhat hard times, were renting rooms in their homes for extra income. Let me add here that although schools, theaters, and restaurants were segregated, public transportation (streetcars) and public libraries were not. In DC, the employment situation varied widely for African Americans. For most of my childhood, my father worked for the federal government, driving a truck in Washington to pick up and deliver items. Some people were unemployed, but there were also domestic workers, laborers, restaurant owners, public school teachers and officials, doctors, dentists, musicians and other entertainers, Howard University professors, preachers, and many others. 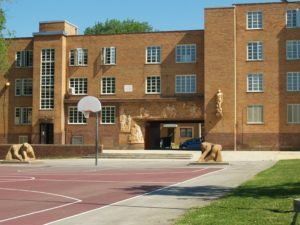 On my ninth birthday in 1938, my family moved to Langston Terrace (which still exists), a group of low-rent houses and apartments that opened that spring for working-class African Americans. Married couples, most with children, were selected to live there. Their incomes could not exceed a stipulated limit. Whenever a resident received a raise at work beyond the limit, or one of the children grew up and went to work, or the couple separated, the family had to move. 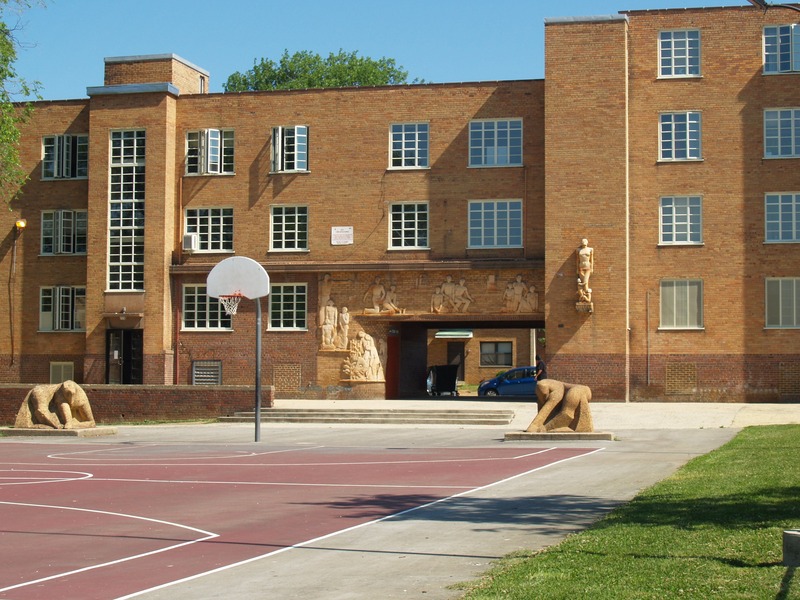 Why did I, as a child, love Langston Terrace? There were recreation leaders assigned to us who, along with the parents’ organization, planned trips and other activities for the children; the Langston branch of the public library opened a few steps from my house; and with so many children in close proximity, there was almost always a friend who could come out and play. Collaborative Classroom: Where do you think we can find these kinds of communities today? Do you think it’s possible to create a Langston Terrace now? Greenfield: These problems are not just about violence in African American communities or even about creating a Langston Terrace atmosphere. Much of the violence is perpetrated by people who are not African American. Many people in our country, and all over the world, are trying to find solutions to the social and economic problems that affect us, and most of the time I am cautiously optimistic, but realize that solutions will not be achieved quickly. Collaborative Classroom: Throughout your career, you have moved seamlessly between different genres and subjects. Two amazing new books (one published and one in the works) perfectly illustrate your breadth: Thinker: My Puppy Poet and Me and The Women Who Caught the Babies. One is a fanciful book about a poetry-spouting dog, the other a celebration of African American midwives. Where did these two ideas come from? Have you ever met resistance from your publishers (or even from within yourself) when you wanted to try something new? Greenfield: I never think that I am trying something new. I write whatever interests me if I think it will be good literature. I complete my manuscripts before I send them to a publisher. My primary publisher, HarperCollins, has never complained about a change of genre, nor have any of my other publishers. Sometimes a manuscript is rejected, but I don’t think it’s about genre. Collaborative Classroom: Your picture books are works of art—inspired text and illustrations enrich each other. You are best known for collaborating with the illustrator Jan Spivey Gilchrist, but you’ve worked with so many gifted artists: Carole Byard, Floyd Cooper, Jerry Pinkney, John Steptoe, and most recently, Ehsan Abdollahi, Daniel Minter, and Don Tate. How do these partnerships come to be and how closely do you work together on the art? Greenfield: For all of my books, except those with Jan Spivey Gilchrist and Daydreamers with Tom Feelings, the illustrators have been chosen, with my approval, by the editors, and we have worked separately with our editors. Tom Feelings got in touch with me and asked if I would come up with an idea and a text to accompany portraits of children he had drawn over a number of years. The portraits are beautiful, and I was happy to write a book-length poem to accompany them. Jan and I often talked briefly about a book I was planning to write. Then we went our separate ways. I wrote the text, sent the manuscript to her, and she did preliminary art, which was always beautiful. We then submitted the work to the publisher. 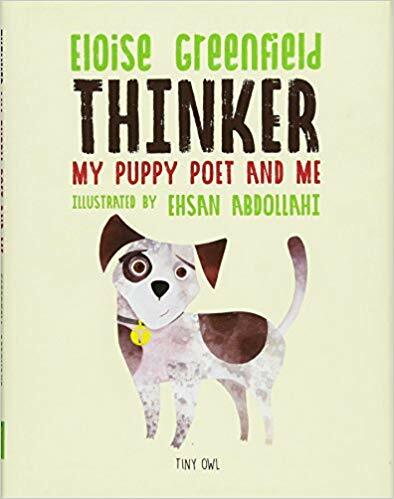 My first contact with Ehsan Abdollahi was a few months after Thinker: My Puppy Poet and Me was published in the United Kingdom by Tiny Owl Publishing. (It will be published in the US in April 2019 by Sourcebooks Jabberwocky.) Ehsan and I met in Scotland when we spoke together at the Edinburgh International Book Festival in August 2018. The idea for Thinker came because I was upset about a few articles I had read criticizing free verse as not being real poetry. I wanted to correct that view and decided to write a picture book that included free verse and an afterword about its techniques. I also included an explanation of the techniques used in writing rap, which sometimes receives the same kind of criticism. I fell in love with Thinker, this puppy who loves words and can only bark, and not talk, unless he is reciting his poems. Ehsan perfectly captures Thinker and his family. The Women Who Caught the Babies: A Story of African American Midwives (Alazar Press) tells, in poetry, the story of this important contribution to African and African American life. 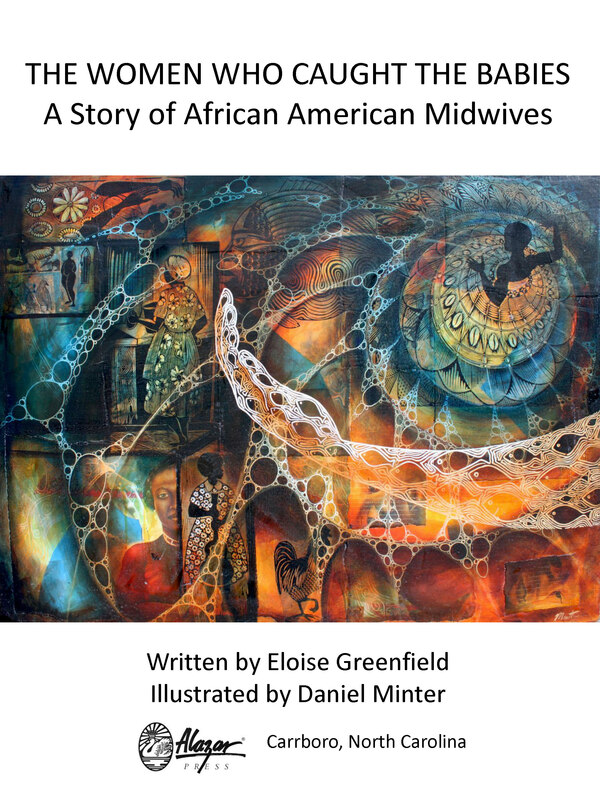 When my daughter was working at a midwifery association, we had a few conversations about midwives, and I am not sure which one of us came up with the idea for a book. However, I do know that, because of my damaged vision, she did much of the research for me. I have not yet met Daniel Minter, but I am familiar with his powerful work. 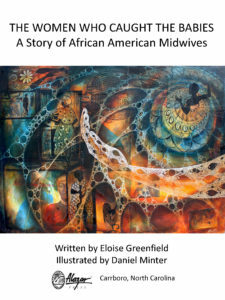 He is the perfect artist for this book because of his research about African American midwives over the years and the beautiful art he has done. My other recent book is Par-Tay! Dance of the Veggies (and Their Friends), with hilarious illustrations by Don Tate. Collaborative Classroom: Describe a perfect day. Greenfield: On a perfect fantasy day, my vision would have returned, and I would be able to read and work at a normal rate of speed and keep up with all of the wonderful books that are being published nowadays. A realistically perfect day would be like today: being engrossed in my work, getting some work done, reading a little, conversing with friends and family, listening to music. Collaborative Classroom: Is there anything else you’d like to say? Greenfield: One of the most important events of my lifetime is the establishment in Washington, DC, in 2016, of the Smithsonian’s National Museum of African American History and Culture. 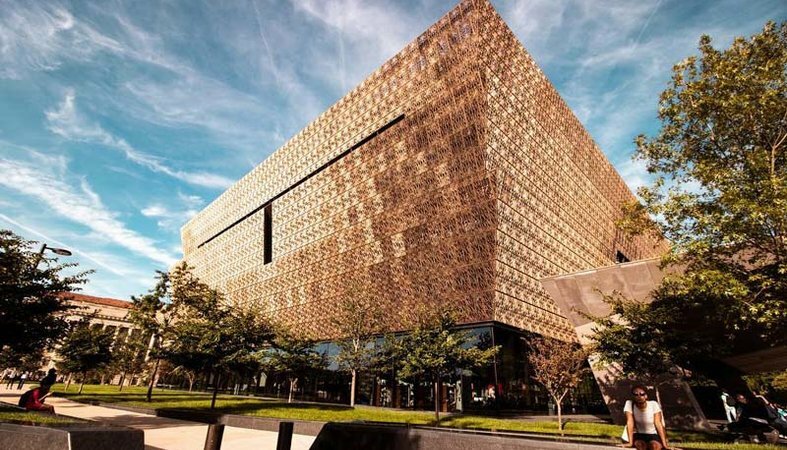 This large, beautifully designed building brings together the pieces of African American life, beginning with our ancestors in Africa and continuing through the present. It includes struggles against captivity, in Africa and the United States, and contributions to the fields of medicine, politics, science, literature, music, art, theater, education, sports, and many, many more. It documents, for the world and for us, who we are. Thank you very much for your kind comments about my work, and congratulations on the important work Collaborative Classroom is doing to produce good writers and readers. Eloise Greenfield was born in Parmele, North Carolina, in 1929 and grew up in Washington, DC, where she still lives. She graduated from Cardozo High School and attended Miner Teachers College for two-and-a-half years. 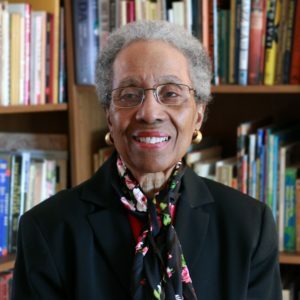 Later, as a young wife and mother, while working as a clerk-typist at the US Patent Office, she decided to become a writer and began to study books on writing. In 1962, Ms. Greenfield had a poem, her first acceptance, published in The Hartford Times. She now has published 47 children’s books. Her mission is to write nourishing books for children, while filling her life with the joy of creating with words. 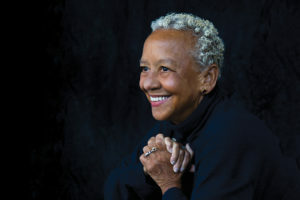 Ms. Greenfield has received many awards, including the Coretta Scott King–Virginia Hamilton Award for Lifetime Achievement; the Coretta Scott King Award for Africa Dream; the Boston Globe–Horn Book Honor Award for Childtimes: A Three-Generation Memoir, written with her mother, Lessie Jones Little; the Hurston/Wright Foundation’s North Star Award; and the Award for Excellence in Poetry for Children from the National Council of Teachers of English. Now a grandmother and great-grandmother, Ms. Greenfield continues to write. She can be found at twitter.com/elgreenfield and at balkinbuddies.com.